Official Google Blog: Atlantis? No, it Atlant-isn't. Since the launch of Ocean in Google Earth, millions of people have started to explore the ocean, and many have been surprised by their discoveries. 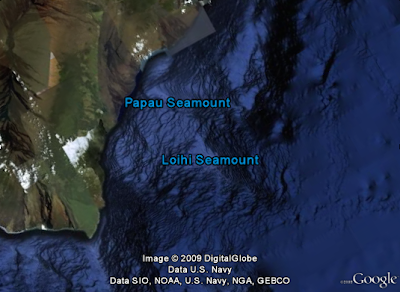 Near Hawaii you can see a new volcanic island in the making called the Loihi Seamount. You can also clearly see the Mid-Atlantic Ridge, an underwater mountain range in the Atlantic Ocean where two tectonic plates are moving away from one another. If you look closely, you can see this ridge connects with others around the globe, forming a nearly continuous mountain range that is over 60,000 kilometers long. 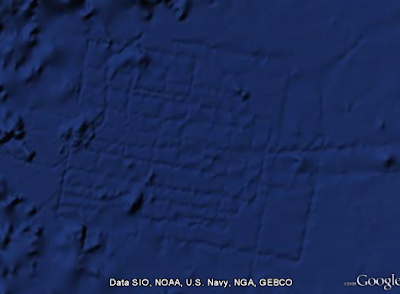 Patterns like this can actually be seen over much of the ocean floor in Google Earth. What is it? Is it real? Why does it look like this? 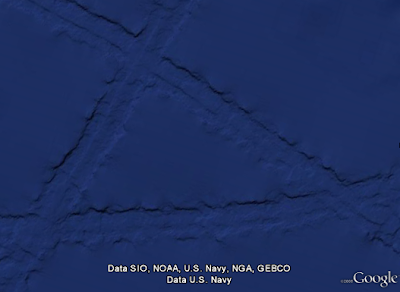 Some have speculated that these are the plow marks of seafloor farming by aliens. If there really are little green men hiding somewhere, the ocean's not a bad place to do it. Mars, Venus, the moon, and even some asteroids are mapped at far higher resolution than our own oceans (the global map of Mars is about 250 times as accurate as the global map of our own ocean). One theory that's gained more traction is that these marks might be the ruins of the lost city of Atlantis. If that were the case, some of the city blocks would have to be over eight miles long - that's about fifty times the size of a city block in New York City (if you zoom in and use the measurement tool in Google Earth, you can do this comparison yourself). So what is it? The scientific explanation is a bit less exotic, but we think it's still pretty interesting: these marks are what we call "ship tracks." You see, it's actually quite hard to measure the depth of the ocean. Sunlight, lasers, and other electromagnetic radiation can travel less than 100 feet below the surface, yet the typical depth in the ocean is more than two and a half miles. Sound waves are more effective. By measuring the time it takes for sound to travel from a ship to the sea floor and back, you can get an idea of how far away the sea floor is. Since this process — known as echosounding — only maps a strip of the sea floor under the ship, the maps it produces often show the path the ship took, hence the "ship tracks." In this case, the soundings produced by a ship are also about 1% deeper than the data we have in surrounding areas — likely an error — making the tracks stand out more. You can see all of the soundings that produced this particular pattern with this KMZ file. Echosounding with sonar is currently the best method for collecting this kind of data, but it's not perfect. One challenge is that it's quite slow. It has to be done from ships or underwater vehicles, and they can't go very fast or they'll spoil the measurement. 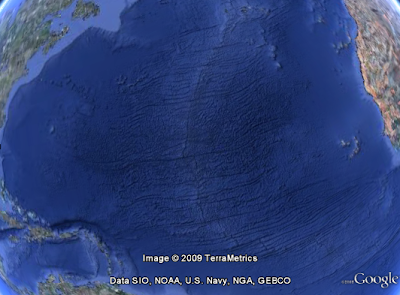 As a result, not much of the ocean has been mapped this way, and huge gaps remain all over the ocean. In fact, the typical hole between tracks is about 20,000 square kilometers, or about the size of the state of New Jersey. So, what if we really wanted to find Atlantis? We probably couldn't do it with satellites — man-made structures simply aren't big enough to be measured that way. But we could map the whole ocean using ships. A published U.S. Navy study found that it would take about 200 ship-years, meaning we'd need one ship for 200 years, or 10 ships for 20 years, or 100 ships for two years. It costs about $25,000 per day to operate a ship with the right mapping capability, so 200 ship-years would cost nearly two billion dollars. That may seem like a lot of money, but it's not that far off from the price tag of, say, a new sports stadium. For now, keep exploring the ocean in Google Earth, and continue to share what you discover. It's great to have so many sets of eyes looking at the data currently in Google Earth and asking questions about what it represents. 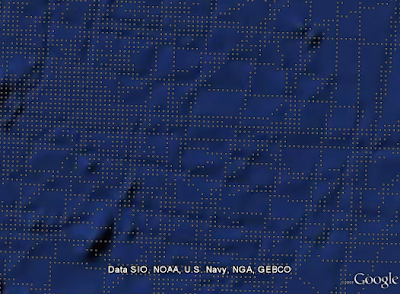 We and our fellow oceanographers are constantly improving the resolution of our seafloor maps, so we promise to work with Google to keep the virtual explorers out there busy.